Looks like we made a wrong turn and somehow ended up in Georgian Bay! 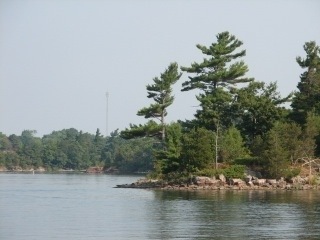 Very pretty here at the 1000 Islands. Lots of places to anchor and swim. Thank goodness we can swim because it has been so warm – 35 degrees and not much of a breeze! 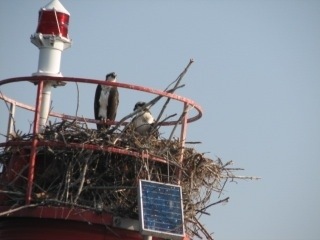 Along the way, we saw all sorts of interesting things such as several osprey nests. We also saw some really spectacular homes and cottages – makes Muskoka look shabby! 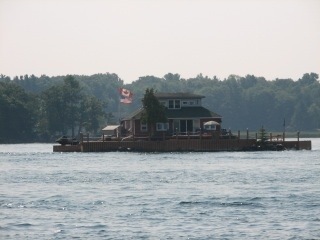 Here is a shot of a home on an island – kind of odd as it was right on the main channel and if you were looking to get away from it all, this would not be the place! 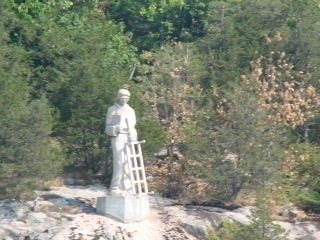 We also spotted the statue of St. Lawrence along the river and if you’re interested in the history behind the statue, click this link. Of course at 2:00 this morning, the wind came up and by 4:00, we realized that we were dragging into the shoreline, so we had to pull the anchor (which was covered in weeds – again) and motor around for a while until we could figure out what to do. We eventually went back to the same place only to have the anchor drag again, so we moved over to the other side of the river and now are sitting here watching the sun come up. The temperature should be a bit better today. We are going to Alexandria Bay and will be touring the Boldt Castle. Should be fun! That was interesting about St Lawrence – lots of history out there.